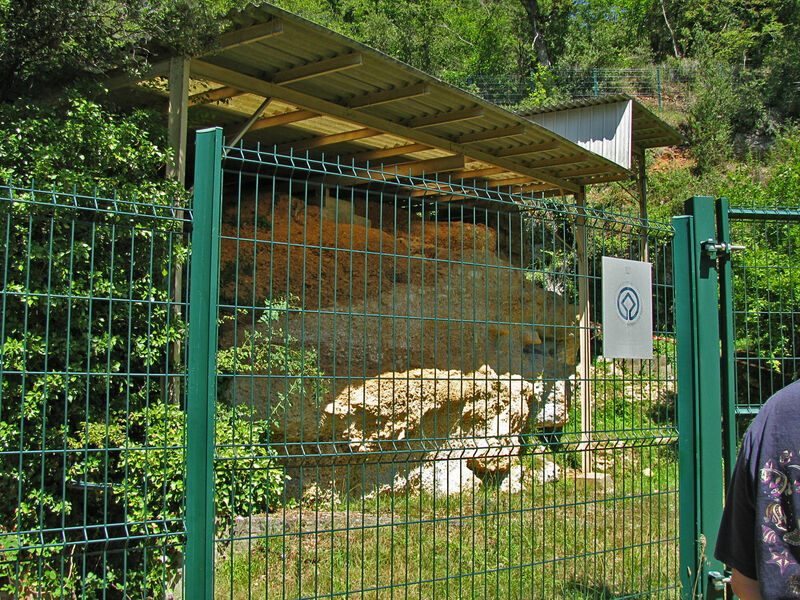 La Micoque derives its name from the farm on which it was found. 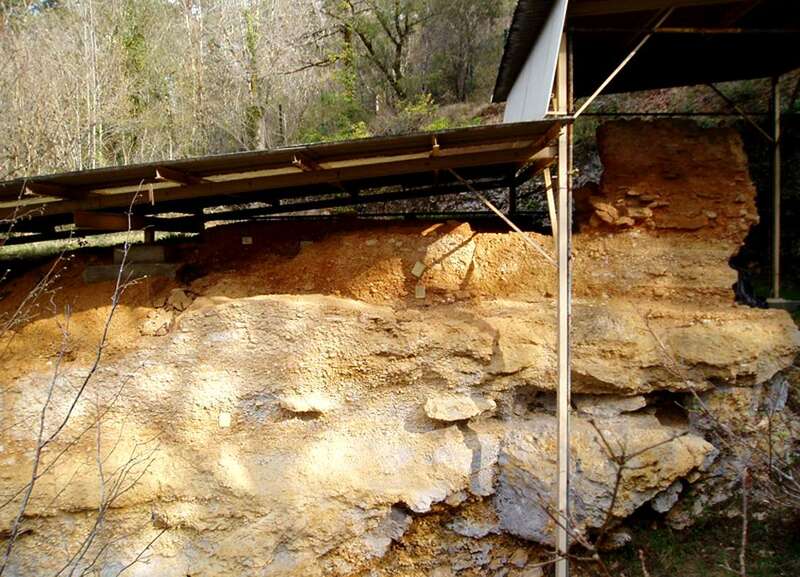 La Micoque is located on the left side of Le Manaurie valley, 500 m from its confluence with the Vézère. 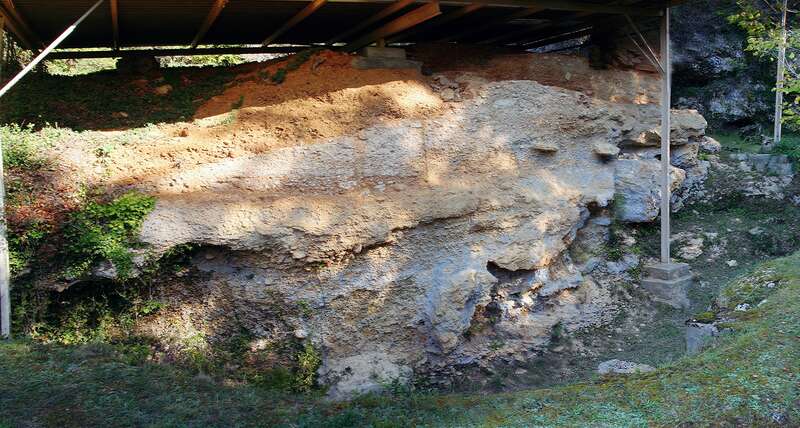 The deposits are protected by a fence and by a roof and the turnoff from the road is not signposted, to limit damage from the weather and vandals. 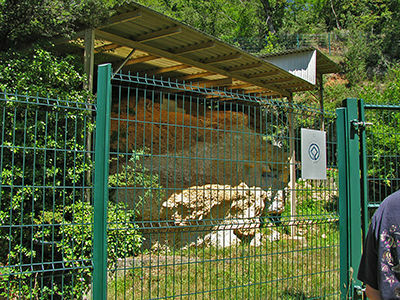 Access is only permitted as part of a tour group, organised from the Ticket Office at Font de Gaume. Map of sites in the Vézère Valley of France, including la Micoque. This is a very good photo of the cross section of La Micoque from 2005, probably in spring of that year, judging by the vegetation. This is a superbly detailed photograph of the site. La Micoque is an open-air Mousterian / Mousterien site, probably at the foot of a rock face, on the left bank of the ru de Manaurie which flows into the Vézère, upstream of Laugerie Haute. 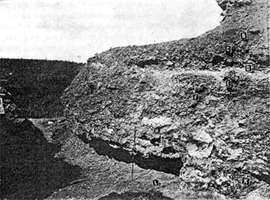 La Micoque was discovered in 1895 by E. Rivière and extensively excavated between 1906 and 1914 by the Swiss antiquarian O. Hauser. There are two Mousterian groups of deposits, and an Acheulean above that. The deposits are from the ancient Palaeolithic, dating from 400 000 BP to 130 000 BP. Cross section of the excavation at La Micoque, by D. Peyrony. A. The first layer, 1.40m thick, lies over a sterile red soil slope. In this scree layer are smaller stones and large conglomerate blocks. B. A layer of limestone scree of large and small elements from the collapse of the cliff or the arch of an old abri or rock shelter. 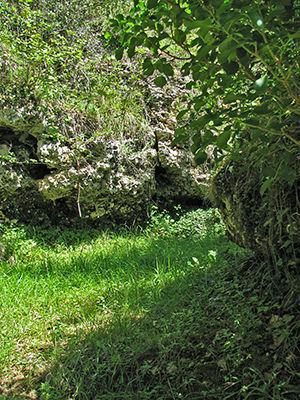 C. The second archaeological level, 0.60m thick, is placed to the front of layer D, away from the valley wall, and is fully covered by D.
D. Small rounded limestone rocks and some conglomerate rocks, 0.90m thick. E. The third archaeological level, varying between 0.50m and 0.60m depth, extends over the whole area, and is substantially horizontal. F. Grey conglomerate 0.40m deep, formed of limestone scree and flint nodules united by a calcareous cement. 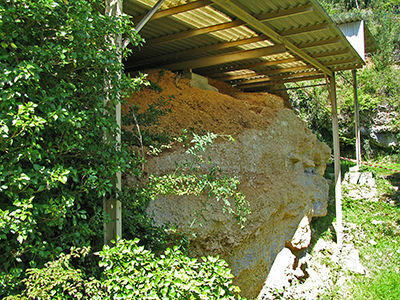 G. Bench of mixed limestone rocks, almost sterile, 0.80m thick. H. The fourth archaeological level, thin and red in colour. I. Conglomerate of rounded stones, 0.15m thick. J. 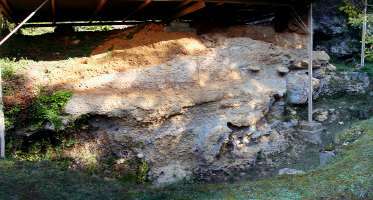 The fifth layer of archaeological material, 0.20m thick. K. Conglomerate 0.25m thick, the same type as level I.
M. Rocky floor 0.50m thick formed of dry limestone scree cemented with lime. N. The sixth archaeological level. O. 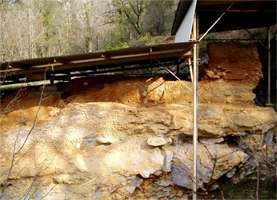 Everything was covered with a high embankment of earth and scree 3 metres thick. Note that Schwarcz et al. 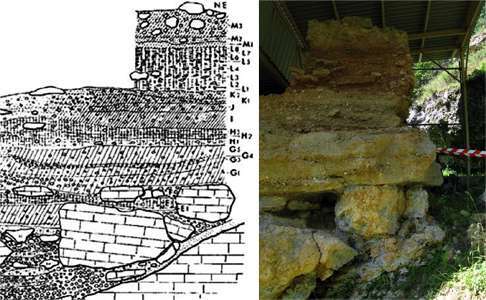 (1988) say that Electron spin resonance (ESR) dates have been obtained on enamel from horse teeth found in Layer L 2/3 of the lower Paleolithic archaeological site of La Micoque. 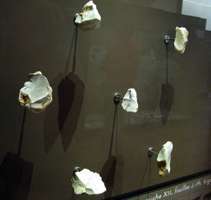 The age given by six of the seven samples analyzed is between 241 ± 15 and 288 ± 10 ka, the ages given by models that postulate early or continuous (linear) uptake of uranium by the tooth, respectively. With a little ingenuity and Photoshop, it is possible to match up the above cross section with my photograph of the site. Not only the layers, but even individual rocks may be identified when the images are lined up in this way. 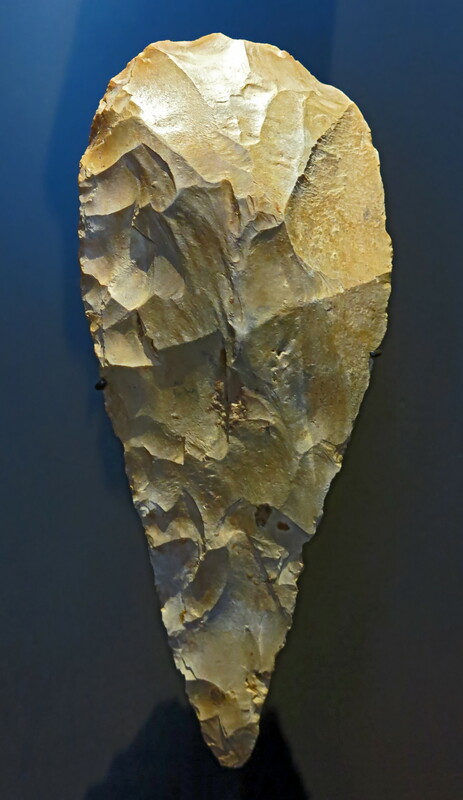 The deposit of Micoque was discovered accidentally in 1895, when the owner, working his fields, noticed some flint objects brought to the surface by farm implements. They appeared to him to be similar to some types that he had noticed amongst the excavations at Les Eyzies. He reported his discoveries to Pierre Fournier of Laugerie Haute, who collected some specimens, and showed them to E. Rivière and the antiquarian Delmas. Excavations began the following year and continued until 1932, almost without interruption. 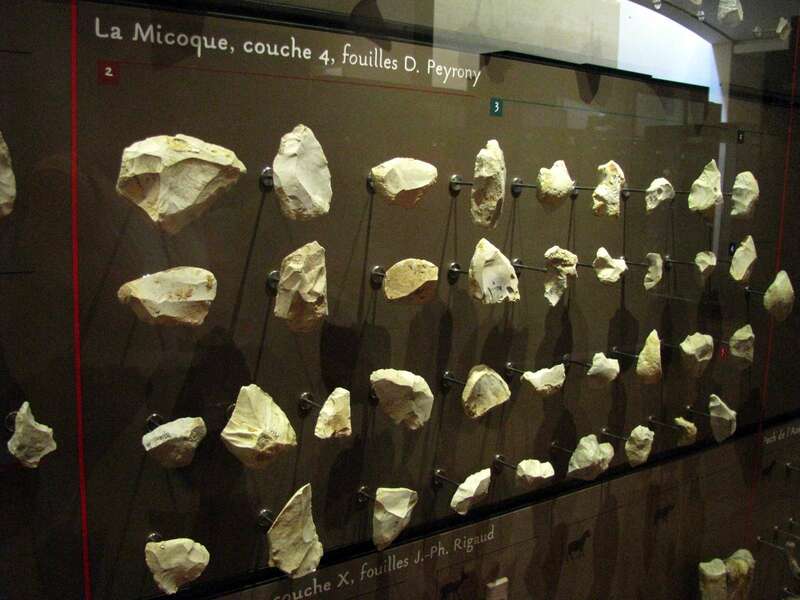 The site has seen a succession of major figures of prehistory including Emile Rivière, Louis Capitan, Edouard Harlé, Emile Cartailhac and Denis Peyrony. 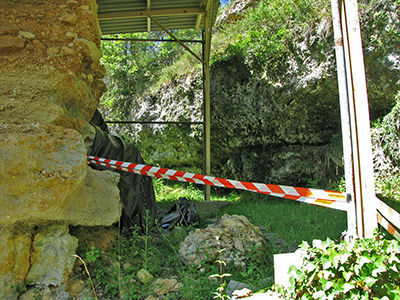 A multidisciplinary team resumed the search in 1983, after François Bordes' excavations in 1956. This work used dating methods that allow scientists to identify dates of sedimentary deposits and fossil remains of fauna and flora. 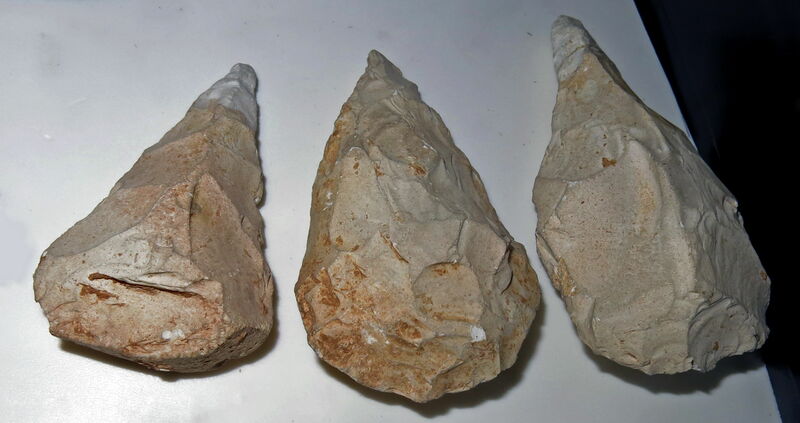 Acheulian hand axes, ca 300 000 BP, from la Micoque, France. 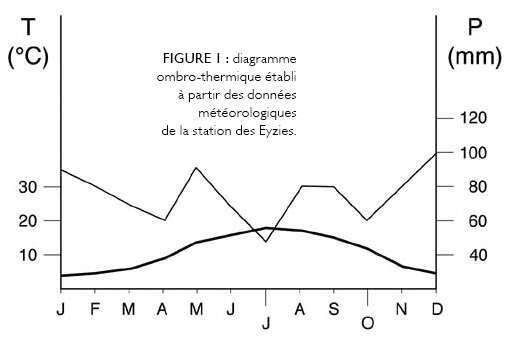 Present day climate at Les Eyzies. 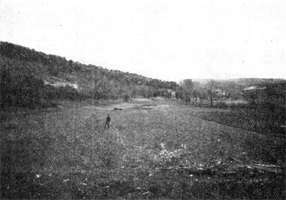 View of the valley of the stream of Manaurie to its confluence with the Vézère. To the left, on the slope, the whitish deposits of La Micoque. At the back, the cliffs bordering the left bank of the Vézère. 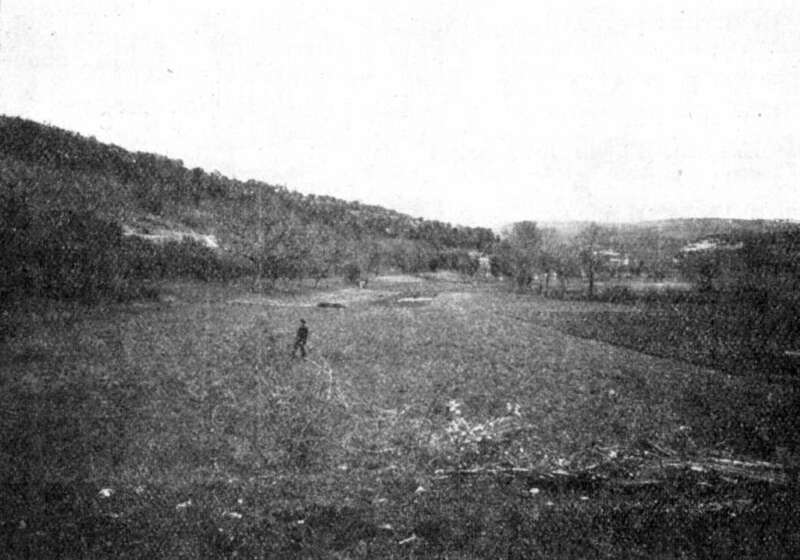 Before the first excavations, this part of the terrain was not distinguishable from the rest of the slope, which rests at an angle of 33°, apart from a few white limestone rocks poking out above the ground. 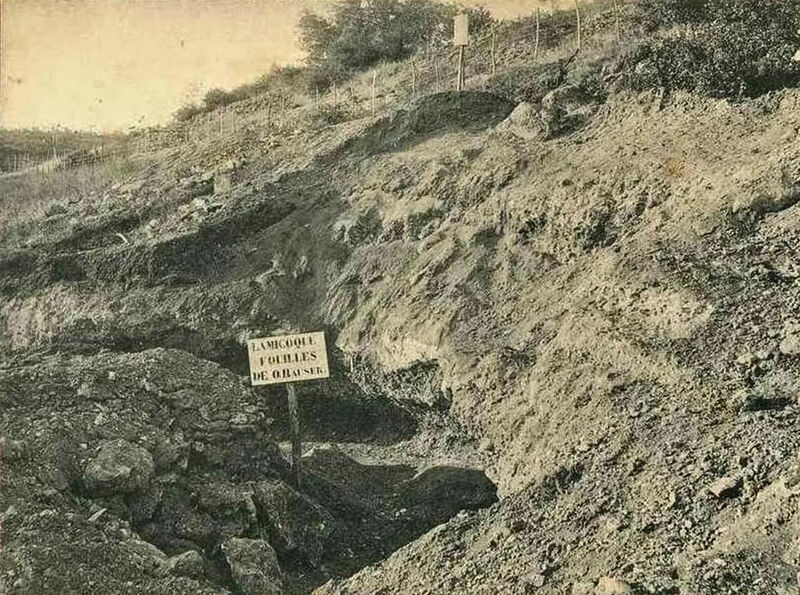 Otto Hauser's excavations at la Micoque, from an old postcard. A comparison between the industrial-glacial correlations often used in Britain during the 1920s, and the correlations suggested by Breuil in 1932. Note the bunching of industries in the British scheme of the 1920s: most Palaeolithic industries cluster in the Riss-Würm; Moir's controversial Early Chellean and Pre-Chellean industries cluster much earlier in the glacial sequence. There are few faunal remains from the lower archaeological levels. Level 1 contains only horse ( Equus caballus cf mosbachensis ) and bovids, Level 2 contains these species with some additional rhinoceros remains. Level 3 has abundant faunal remains, mostly horse with occasional bovids and red deer. Level 4 contains only horse and bovids. 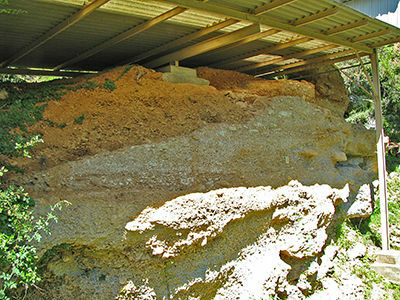 The stratigraphy of the deposit, 10 metres high, consists of limestone sediments that form multiple layers of archaeological deposits. 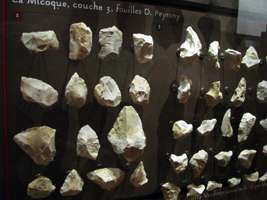 The flint tools found there are among the oldest in the Périgord. The upper layers are dated between 150 000 BP and the oldest of about 400 000 BP. This is the same Tayacien core or nucleus that D. Peyrony describes as Fig. 2, No 3 from Couche 1 in his 1938 work, and is the farthest to the left in my photograph of couche 1 from the Musée National de Préhistoire, Les Eyzies. The photograph is taken from a view which rotates the core just slightly anti-clockwise on its vertical (y) axis compared with the drawing. I rotated my image on its horizontal (z) axis to conform as closely as possible to the drawing's orientation. There is no significant rotation on the third (x) axis of rotation between the two views. The Tayacien is an industry of small rough flakes. Source: D. Peyrony (1938) / Original, display at Musée National de Préhistoire, Les Eyzies. The core above at a higher resolution. As recounted by Bordes (1984:57) the naming of the Tayacian came about without a lot of fanfare. 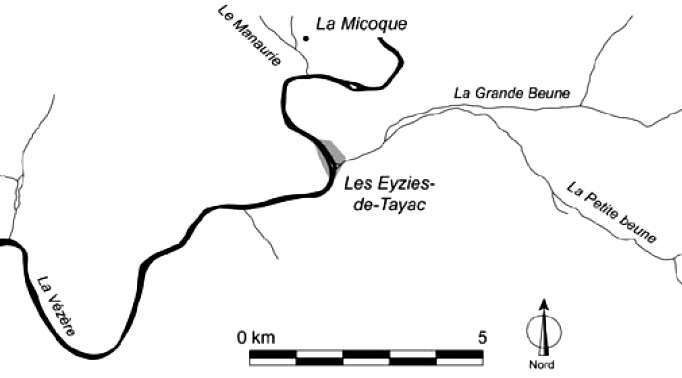 After the excavations at La Micoque by Hauser from 1914-1918, Peyrony went back to the site in 1929 and discovered a series of levels that underlay the so-called Micoquian horizons (Peyrony 1938). 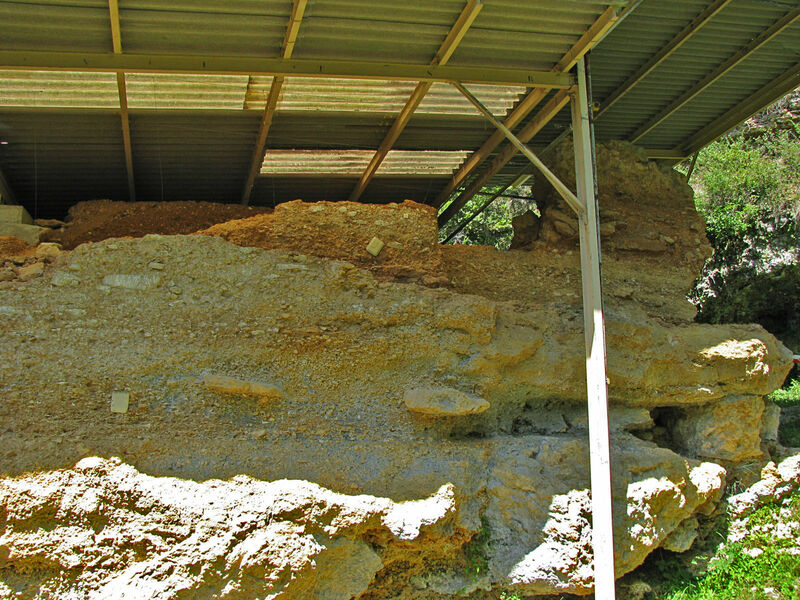 In these layers were some assemblages that generally lacked the kind of refined bifaces that had come from Hauser’s excavations and consisted instead of large flakes and rough flake tools. Being a bit undecided as to what to call this industry, Peyrony took the advice of the Abbé Breuil, who had happened to pass by the site for a visit on his way to the nearby village of Les Eyzies-de-Tayac, and who suggested naming it for that village. At the time, the problem faced by Peyrony was that it was difficult to deal with a non-handaxe industry that preceded the Mousterian. In the previous century, de Mortillet (1869, 1883) established a unilineal scheme for the Paleolithic based on the kinds of artifacts represented rather than on paleontological grounds alone (Lartet 1861; Lartet and Christy 1865-1875). De Mortillet’s sequence began with the Chellean and Acheulian, which contained bifaces; followed by the "Epoch of Le Moustier," or the Mousterian, which was a more flake-based industry; and subsequently the Solutrean and Magdalenian, which had more sophisticated lithic assemblages and bone tools. 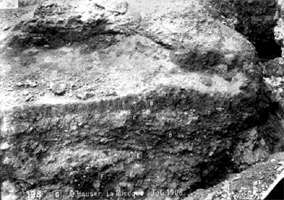 Later, Commont (1910, 1913) continued the refinement of the unilineal ordering of the Paleolithic based on his work in the Somme Valley in northern France. 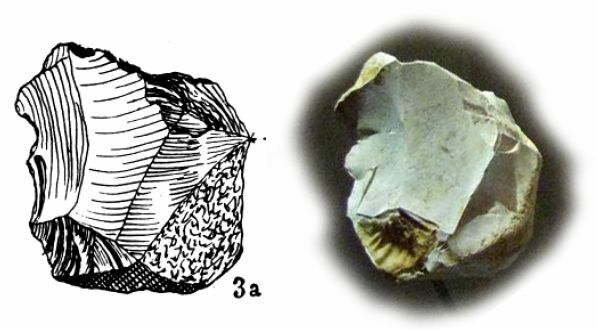 It was Breuil (1932; Breuil and Lantier 1959) who proposed the existence of two major contemporaneous Lower Paleolithic phyla, the Clactonian (composed on flake tools made on unprepared blanks with large, unfaceted platforms) and the Acheulian (which contained significant percentages of bifaces of various types). 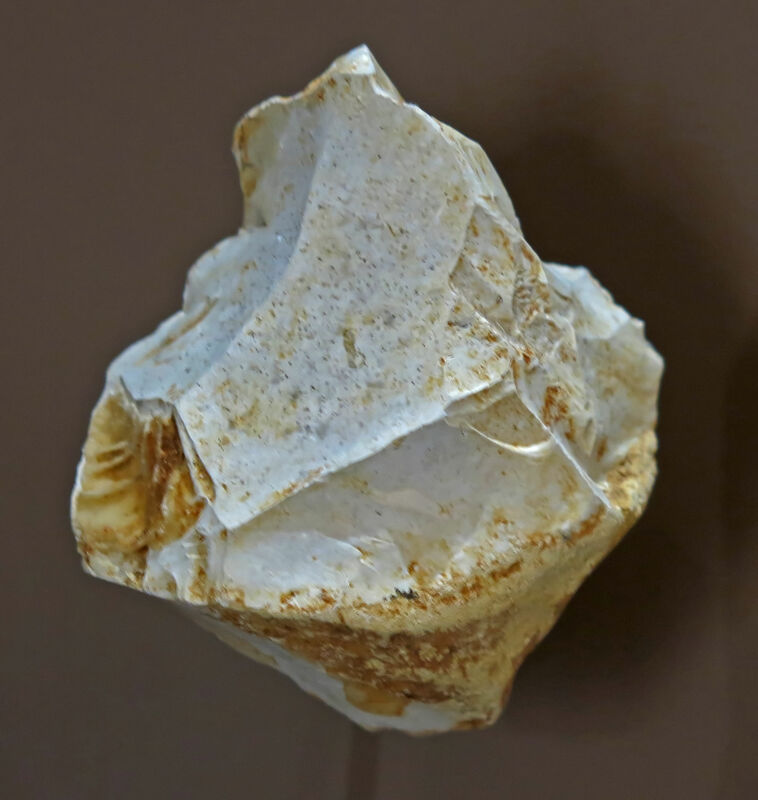 By isolating two independent "phyla" in the Lower Paleolithic, it was thus possible to have non-biface industries preceding the Mousterian, and for him the Tayacian was then just one variant of a number of "Pre-Mousterian" industries. In the extreme paleontological perspective that was prevalent in archaeology at the time, the Tayacian was thus seen as a direct descendent of the Clactonian, and it chronologically preceded the Micoquian. 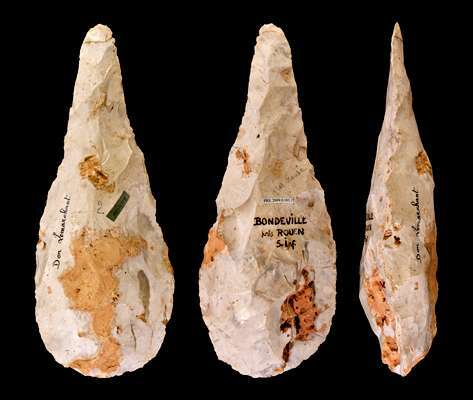 The linkage to the Clactonian was based on the fact that the Tayacian had similar sorts of large, wide flakes, but there were also more evolved aspects of the Tayacian in that it exhibited a higher degree of platform faceting and less pronounced bulbs of percussion. In turn, the Tayacian was seen to have eventually evolved into the Levalloisian, which still later merged with the Acheulian to produce the "Cave Mousterian." 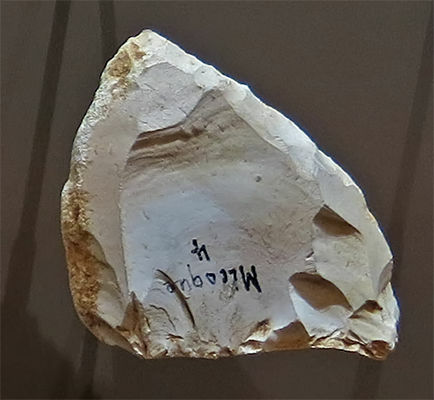 Thus, for Breuil the Tayacian was a flake industry without handaxes, with some degree of platform preparation, but lacking the degree of core preparation that would enable it to be called Levallois. It dated to a time before the final Acheulean and exhibited a style of flaking reminiscent of the Clactonian (Breuil 1932). What characterised the deposit is the presence of micoquiens bifaces considered as belonging to the Acheulean industry . These tools, with sharp edges and slightly concave, have a thick heel and a finely retouched end. They are associated with scrapers or backed knives. 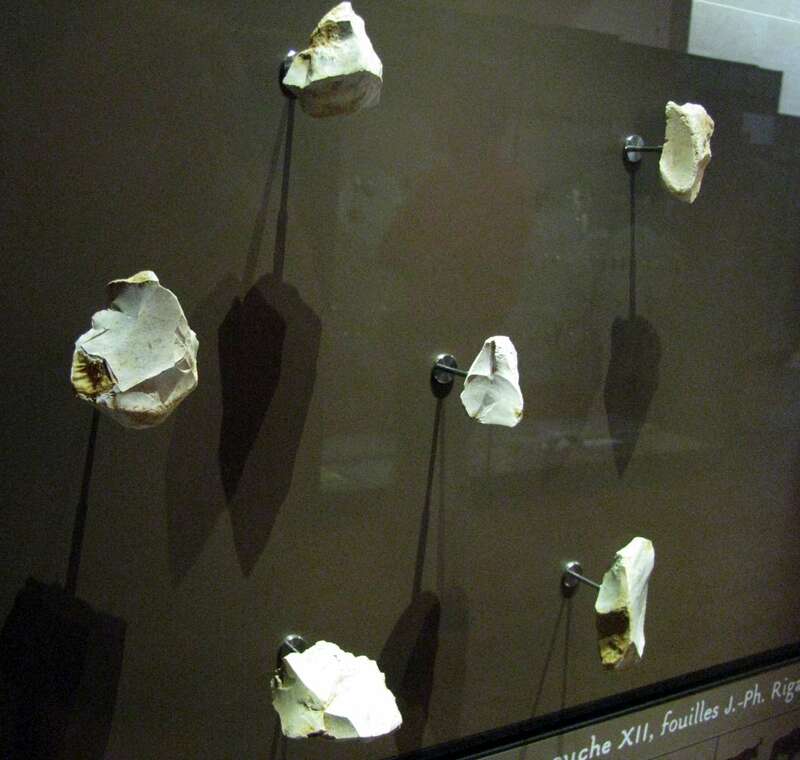 Most of these bifaces are kept at the Musée National de Préhistoire, Les Eyzies. 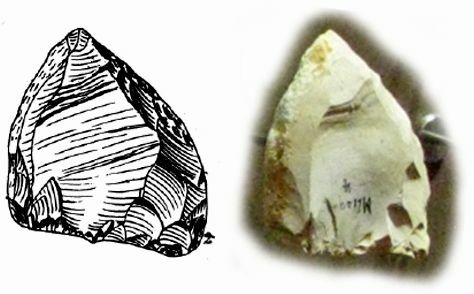 This is the same 'pointe-couteau' or pointed knife from the 'Old Classic Mousterian' that D. Peyrony (1938) describes as Fig. 9, No 2 from Couche 4 in his 1938 work. The photograph is taken from a view which rotates the tool anti-clockwise on its vertical (y) axis compared with the drawing. I rotated my image on its horizontal (z) axis to conform as closely as possible to the drawing's orientation. There is no significant rotation on the third (x) axis of rotation between the two views. A better version of the pointed knife above. 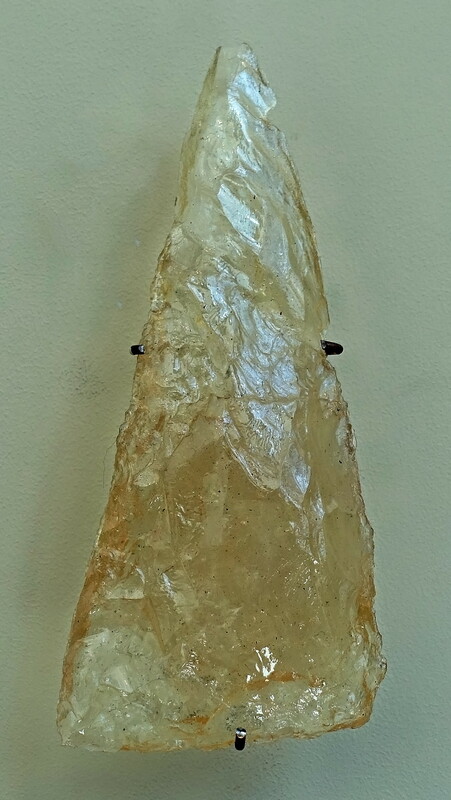 Hand axe from La Micoque, 80 000 BP - 50 000 BP. 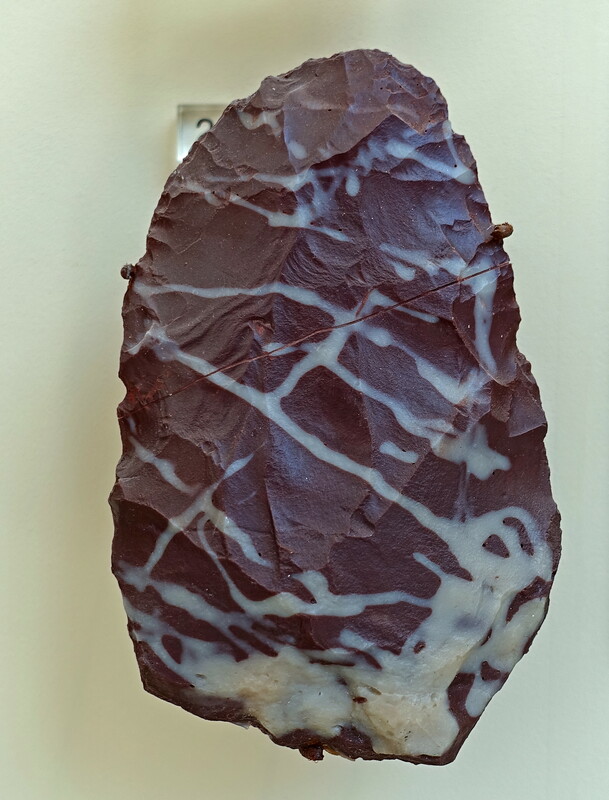 Biface Micoquien - Different views of the same specimen. Permission: I, the copyright holder of this work, hereby publish it under the following license: Creative Commons Attribution-Share Alike 3.0 Unported license. Crystalline Quartz knapped into a point from Kůlna Cave in the Moravian Karst, Micoquian. Hand axe in veined radiolarite, Karolin, okres Kroměříž, Micoquian. Otto Hauser at la Micoque, in a trench which was 22 metres long and 8 metres deep. 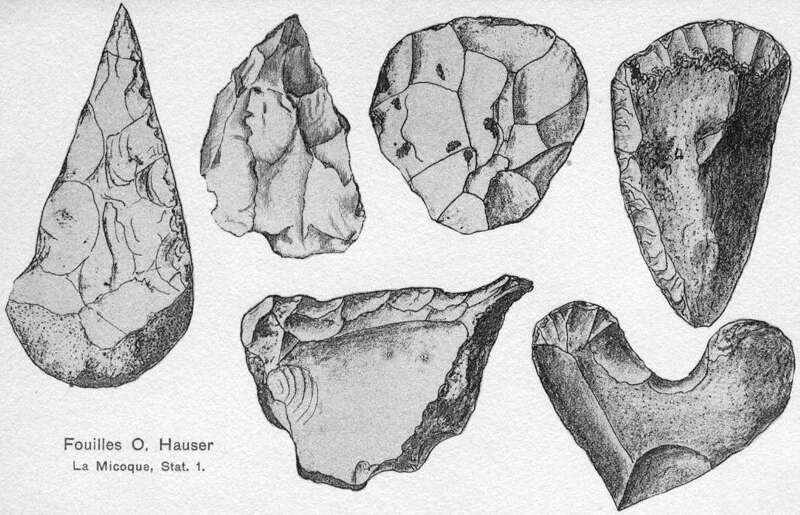 Tools from la Micoque, found by Otto Hauser. 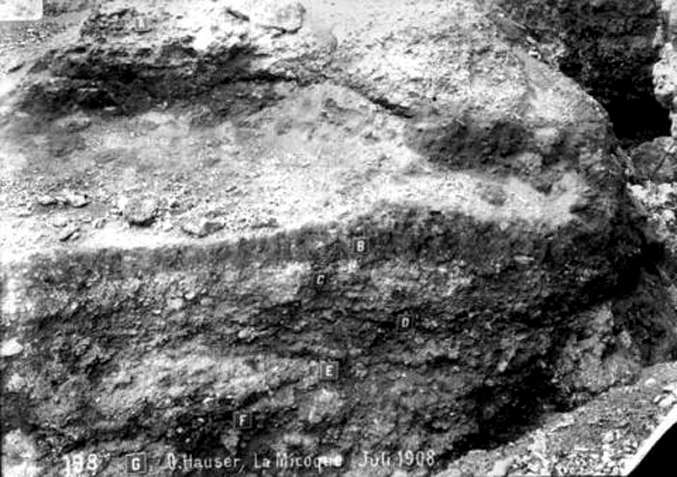 Photograph of the upper layers of the Micoque by Hauser in 1908 (D = layer 6, C = layer 7, B = layer 8). Chauvet and Rivière (1896), Capitan (1896), Harlé (1897) Peyrony (1898 and 1929 to 1932), Coutil (1903 to 1905), Cartailhac (1905), Hauser (1906 to 1907), Bordes (1956), and, more recently, A. Debénath and J.Ph. Rigaud (1983 to 1996). 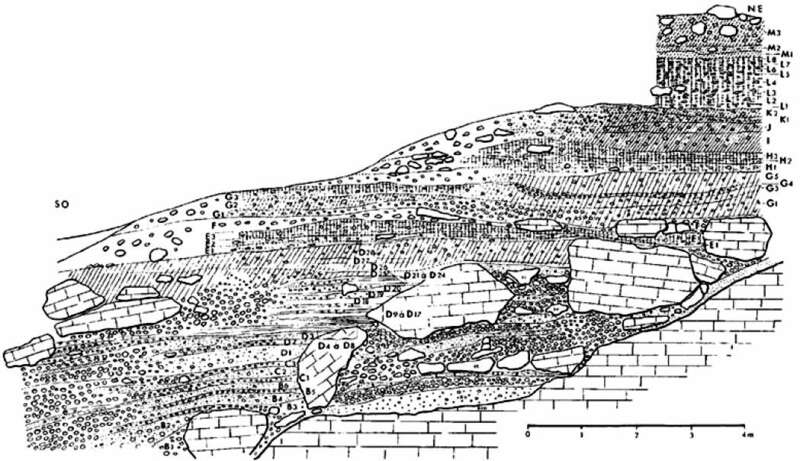 D. Peyrony (1938) was the first to establish a stratigraphy of the entire deposit. 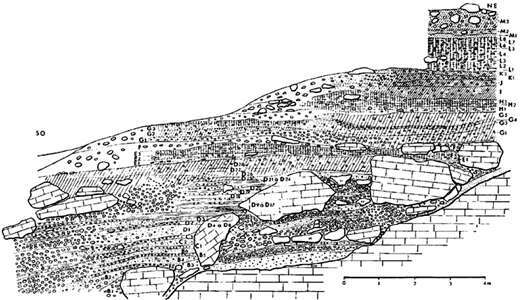 He describes a dozen horizontal layers and interprets the basal layer (A) and the top layers (N and M) as screes built in cold climates while intermediate layers B to L are presented as river deposits formed in a temperate climate. A is assigned to the Mindel, B to L to the Mindel-Riss interglacial, Riss M, and N to the start of the Würm. 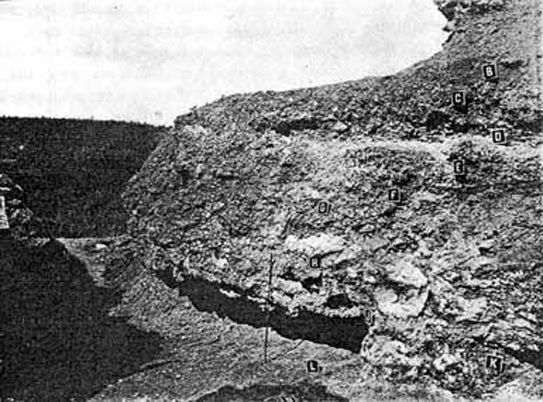 This view is criticised by Breuil (1938) for which the pebbles in these deposits have a cryoclastic origin, their roundness due solely to the phenomena of cryoturbation and solifluction. (Cryoturbation is frost churning, referring to the mixing of materials from various horizons of soil due to freezing and thawing, and the movement of the soil. Bordes and Prat (1965) and Laville and Rigaud (1969) and Laville (1973) adopt this interpretation and propose that these sediments are deposits under an abri, a rock shelter. 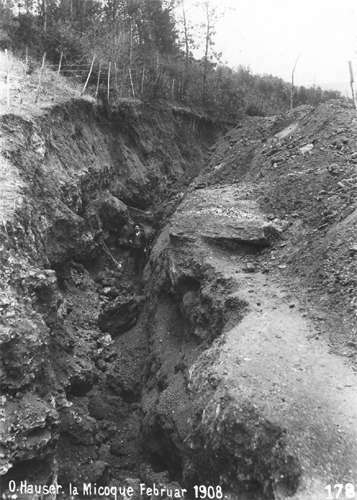 The "scree" layers are attributed to cold episodes contemporaneous with glacial periods. (A: Mindel, B to E: I Riss, F to H: Riss II, G to L: Riss III, N and M: early Würm). 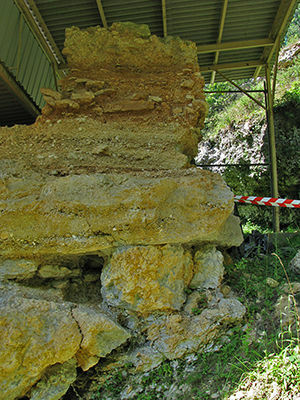 The more "earthy" textures and red coloured levels E, H and L are interpreted as the result of soil built during interstadials and interglacial periods. 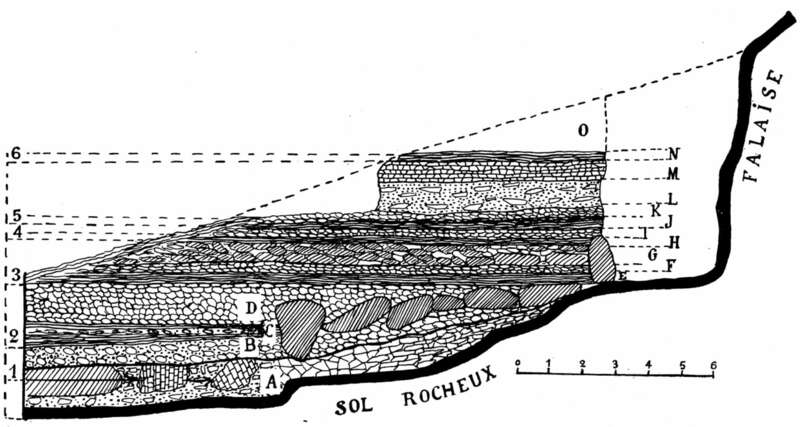 Moreover, Laville and Rigaud (1969) isolated from the rest of the stratigraphy the deposits located in a line of large blocks at the base of the cross section (layers I to XII). Dibble, H., McPherron, S., Chase,P., Farrand, W., Debénath, A., 2006: Taphonomy and the Concept of Paleolithic Cultures: The Case of the Tayacian from Fontéchevade PaleoAnthropology 2006: 1−21. Sémhur, 25 September 2009, Wikipedia. Personal work. Licensing of this work: Permission: I, the copyright holder of this work, hereby publish it under the following license:This file is licensed under the Creative Commons Attribution-Share Alike 1.0, 2.0, 2.5 Generic license and the Creative Commons Attribution-Share Alike 3.0 Unported license.